Is my dog having a seizure? Does my dog have asthma? This is often what dog parents think when they see their dog reverse sneezing. It can be very frightening for a dog parent the first time it happens. Many dogs are rushed to a veterinarian when in fact it is actually reverse sneezing in dogs, which is usually harmless. As a dog owner, you’ve probably experienced your dog having a reverse sneezing fit at some time. It can be incredibly worrying for a first time dog owner, because it sounds so scary. You might mistake it for choking. The way a dog sounds when they’re reverse sneezing makes it sound like a breathing problem, often associated with choking. The first time I saw reverse sneezing I thought my dog was choking and he couldn’t breathe properly. This was scary but it passed and he returned to normal and everything seemed fine. The only problem is that if your dog has one episode of reverse sneezing it is most likely to occur again. And if you don’t know what it is, you may panic. You might think you need to rush out to the veterinarian and have your dog checked out. However, there’s no need to panic or break out the Heimlich maneuver, because reverse sneezing is almost always completely harmless. It will happen to puppies, adults, and senior dogs of all breeds. It is known to occur more often in smaller breeds and in Brachycephalia (flat faced) breeds, like Chow Chows, Chihuahuas, Pekingese, Lhasa Apso, French Bulldogs, Pugs, Bull Mastiffs, English Toy Spaniels. and Shi Tzus. Despite how horrible it sounds, reverse sneezing is a very simple thing. Instead of expelling air out like a sneeze, they take air in very quickly. It is caused by a spasm and it is involuntary in your dog. Reverse sneezing can last for a few seconds or a few minutes. However, it is passing and will not continue for a long time. It can happen several times a day depending on the dog and their environment. Even though it is called a sneeze in dogs, I liken it more to hiccups. When I see my dog reverse sneezing it reminds me of when I experience the hiccups. This is because it can go on for a few minutes and it is a repeated event. Reverse sneezing in dogs is caused by the same things that cause a sneeze, like dust, powders, strong perfumes, cleaning products and outside particles. Dogs may also begin to reverse sneeze after getting too excited or due to a sudden change in temperature. If your dog is taken from a warm environment inside the house outside into a winter snow they this may cause reverse sneezing due to the quick change in temperature. Reverse sneezing in dogs can occur in the middle of the night in any part of the house, out on walks, or in the car. These sneezing fits will probably scare any children around, as well. You just have to remind yourself that this is nothing to worry about unless your dog already has other major issues. Sometimes dogs get mites in their nose. Canine nasal mites can cause itchiness of the face, discharge from the nose or nose bleeding. The mites can cause normal sneezes as well as reverse sneezing. If you suspect the cause is mites you need to take your dog to the vet to get it checked out. Your dog may be prescribed anti-parasitic medication. You’ll know your dog is reverse sneezing when you see them inhaling rapidly and snorting. A reverse sneeze is basically a spasm fit, and there are actually a few ways to help your dog get through it quickly. When you notice that your dog is reverse sneezing, you can try moving them to an area with fresh air. This helps because there will be fewer particles in the air to disturb their respiratory system. Then, you can try blowing on their face, and if that doesn’t work, try holding their nostrils shut for a split second and massaging their throat gently. This will make them calm down and swallow, which will most likely stop the fit. The motion of massaging your dog helps them to overcome the spasm causing the sneezing. It is very important to keep yourself calm when you see reverse sneezing in dogs. If you panic and become stressed about it this causes your dog to become tense and it doesn’t help the situation. You can help your dog become calm by staying calm yourself. By educating yourself on what a reverse sneeze looks like, you’ll be helping yourself stay calm when it happens. It is worth talking to your kids about it too. If they are young but old enough to understand the situation you can talk to them about reverse sneezing and staying calm when it happens. This will help your dog and your children. You really can preempt a stressful situation by having a family talk about reverse sneezing in dogs before the kids see it happen. How to prevent reverse sneezing in dogs – tips! You can decrease the chances of your dog getting in these fits to begin with by not using perfumes or carpet cleaners around them. Keep your dog away from the part of the house being dusted, cleaned or vacuumed. It’s completely understandable that owners would be worried by reverse sneezes. You’ll want as many preventative tips as possible. As long as you have a healthy, stable dog, reverse sneezes are nothing to worry about. Veterinarians may prescribe antihistamines if your dog experiences reverse sneezing episodes extremely frequently, especially if they’re brought on by allergies. 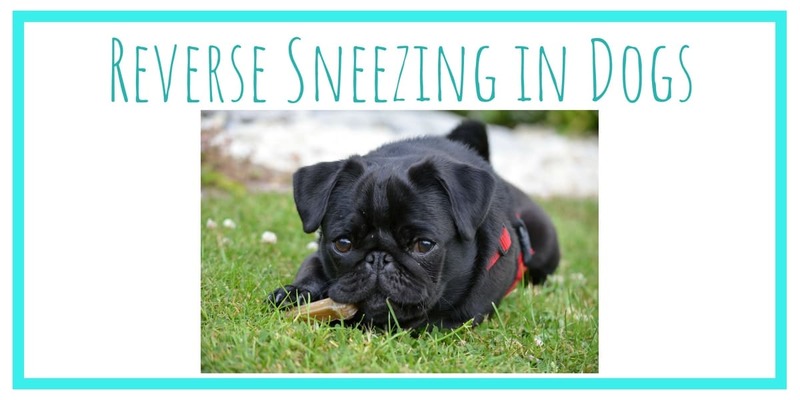 Some dogs experience more reverse sneezing in spring, the hay fever season! If you suspect hay fever symptoms are causing the reverse sneezing then speak to your vet about giving your dog antihistamines. ⇒ Are you concerned about trimming your dog’s black toenails? Take a look here. ⇒ Sick of your dog shedding fur all over the house? See here. ⇒ Do you need to remove fur mats from your dog’s coat? Find out more here. This entry was posted in Dog Health on July 21, 2018 by Didi.